The AIA National Convention is right around the corner, and the Metal Construction Association (MCA) is excited to expand its presence at the show this year. We’re not just planning to take up more floor space this year (though we will be bringing a shiny new display), we’re also excited to offer a new showfloor educational program for AIA CE credits. So stop by booth 1303 within the Metal Pavillion between June 20-22, 2013 at the Colorado Convention Center in Denver to say hello, and see some of the exciting things MCA has to offer. 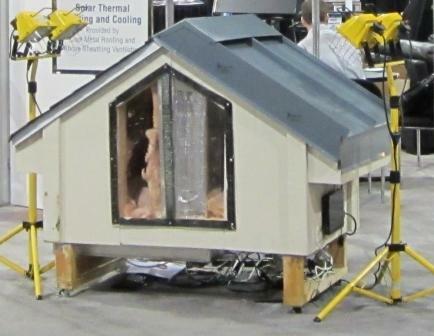 In the booth you’ll be able to see a mock roof and attic assembly that will demonstrate the energy efficiency of metal roofs compared to a conventional asphalt shingle roof. We’re also bringing along some of our favorite case studies and technical articles, and, of course, we’ll be there to answer questions. We hope you’ve signed up for Scott Kriner’s seminar: “Metal Roofing: The Perfect Platform for Solar Technologies,” in which you will learn about metal roofing and photovoltaic systems, and why the two are an ideal pairing in new and retrofit applications. Scott, MCA’s technical director, will conduct the session on the convention showfloor in CE Theatre B (booth 4156) on Thursday, June 20, from 12:30 – 1:30 pm. We’ve heard that it’s sold out, but you may want to double check with AIA on-site, or feel free to stop by the booth to speak with Scott and find out when the course will be offered via free webinar. We’re looking forward to being in Denver next week, and hope you’ll stop by to see us at booth 1303. And be sure to check back here over the next couple of weeks–we’ll try to post some fun examples of of our favorite metal construction projects in Denver.